I have to say that the idea of coming up with an idea, then working your tail off to bring it to fruition is insanely rewarding. There’s also some not-so-great things that come with owning a business and I would be remiss if I hid the fact that I experience challenges on an almost daily basis. I wanted to write this post for anyone who is either considering making a similar move in their career, or someone who already has and feels lost and hopeless with where they are. 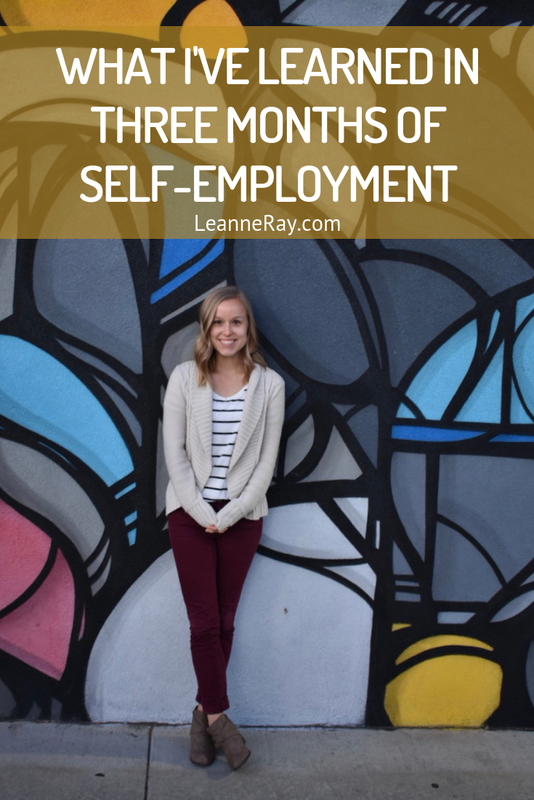 Here are six things I’ve learned since starting this crazy self-employment adventure. Sometimes you have to pivot, and be okay with it. Leave me alone when I’m doing my work. I swear I’m not a totally mean, stand-off-ish person! But these are surprisingly true. Imagine my dismay when what I originally set out to accomplish doesn’t actually work. I quickly learned that sometimes it’s necessary to switch directions and try something new without spending too much time dwelling that the “million-dollar idea” I had didn’t land. One thing that I didn’t have in my original business plan: the Healthy Buzz podcast which is turning out to be one of my favorite projects to date! In-person connection is more important than an online presence. Social media is fun and a great way to connect with other like-minded people. I also love it as a tool to showcase my personality and nutrition approach, portray my business mission and educate people in playful and creative way. One thing that social media isn’t: a catchall marketing tool. There’s a difference between interacting and engaging and actually generating revenue. While I knew this probably wouldn’t be my biggest client referral source, I was surprised at just how few people came to me this way. I also want to say that I thought I knew a lot about various social media platforms but there is always SO much more to learn. It’s one thing to use Facebook and Instagram regularly - it’s completely different to actually understand the strategy behind turning it into an effective business tool. This one comes straight from one of my biggest sources of inspiration in the online business world - Pat Flynn of Smart Passive Income. His mission is largely focused on providing value and serving customers above all else and he is extremely generous to his fans. Now, of course every business owner is providing something of value because otherwise, um, it wouldn’t be a business. HOWEVER, I think a lot of entrepreneurs are primarily focused on making money as fast as possible, instead of providing great customer service and building genuine relationships for long-term partnerships. Real talk: I do have bills to pay and I can’t just be giving away my time for free. But I do subscribe to the theory that if you focus on solving a problem and showing compassion first, ideas on how to make it mutually beneficial will come. Staying On Task Can be hard. I get daily business tips in my inbox by an entrepreneur named Larry Jansky and I would highly recommend it to others. He provides short and powerful tidbits of knowledge that start my day on a positive (and motivating!) note. One of the most recent emails he sent said, “You can get ahead by simply controlling your attention - because most people don't do a good job of it”. How true is this?! Turned off mobile notifications on Facebook. I just counted, and I’m in 27 different groups on Facebook (mostly business-related, some just for fun). TWENTY SEVEN. I get a lot of value out of these, but it’s a way more efficient use of time to designate specific blocks throughout the day to check-in and spend 10 or so minutes catching up and contributing to the conversation, rather than staying constantly connected. Started using Todoist. This might be my favorite new tool of 2018. It seems so simple, but it’s basically a glorified to-do list with drag and drop capability and a color-coding system to help with prioritization. I still love my paper lists, but it’s nice to have access to this at all times (via computer or app). I start every day prioritizing this list. Learned to batch tasks. If you were to ask me what a normal day looks like, it would be really hard to answer. On any given day I could be working with clients (or creating new materials for them), writing blog posts and social media content, networking, creating new recipes, or giving a presentation at a workplace. Just like in cooking, I’ve found it helpful to batch similar tasks together instead of flying by the seat of my pants. If I want to photograph a recipe, it makes more sense to do two or three while I have everything out. If I’m in writing mode, I may as well knock out a couple of pieces of content. Efficiency is a key indicator of success. Also known as, “work smarter, not harder”. It took awhile for this to sink in with me. I could easily work on my business late into the night, early in the morning and all afternoon on weekends if I didn’t set boundaries. I think deep down I felt like if I was always busy, that would equate to more business and the perception that I was killing it (so dumb - but so true). The reality is, not only is this totally unnecessary, it’s an implosion waiting to happen. After being left to my own devices every day, I quickly learned that if this whole thing was going to work, I’d have to come up with a model that adds tremendous value to my customers but also makes sense for my own emotional well-being. This is why I’m constantly making changes to my offerings based on client feedback and my own learning experiences. p.s. I’ve got some big changes coming to my coaching services in 2019 and I can’t wait to share them! These things take time to build, and there are so many hard decisions to be made along the way. I’m a big believer that persistence is HUGE because sometimes it would be way easier to quit when things get hard. Persistence is my word of the year because I wanted to prepare myself for the times when I had these self-doubting thoughts or second-guessed my decision to go solo. If there is one thing to take away from this article, it’s to remember that you are unique and have something special to offer the world (as said by Marie Forleo). Sometimes it just takes time to figure out how to deliver the message in a way that resonates with a large group of people. I'll be sharing the details on my new & improved nutrition coaching services soon. If you want to be among the first group to know, join my email list!